I took my time reading Roar and marking every quote or scene I wanted to remember. Roar was so swoon worthy and I am not going to lie I loved Rora and Cassius relationship but still swooned for Locke in the end. Roar had such great character and world development but most stunning was Cora's in depth and beautiful descriptions of the storms themselves. I have always been drawn to twisters and have read a couple YA fantasy books with storms but I have never read one that actually went as detailed into the way the storms build and the beauty even in the face of destruction. You know when you mark a book with 37 quotes that you felt were breathtaking then that book has made it's mark. Rora was such a fierce character who really grows from being naive to having to learn the trials her kingdom has faced and how sheltered she really has been. Cassius is my misunderstood bad boy and I so need more from his POV. I loved how complex he was and how I think he saw right through Rora. Just so many misunderstandings between him and Rora had me wanting to fix everything for them. Cora Carmack this was stunning and thank you for writing such a fantastic world. This is a must read and I can not wait for more. Storm magic, self discovery and adventure - yes! “Challenge a tempest, survive it, and you become its master.” – The Tale of Lord Finneus Wolfram Cora Carmack’s Roar is churning with intriguing danger and crackling electricity like the storms it seeks to conquer in its pages. The idea of a world so wrought with storms that they must be challenged to be defeated, and that there are humans capable of wielding their power has a great promise for action and magic. And that’s exactly what you get as this journey begins. Aurora comes from a long line of Stormlings, who reign over lands as royalty and offer protection to its citizens. Rora, however, has no magic of her own and must marry a Stormling Prince from another land in order to preserve her family name. And if her secret, her familial shame of being born without magic is discovered before the marriage, all could be lost. A chance meeting changes Rora’s story, the very possibility for being the princess that her mother and people have always needed her to be. Can she challenge a storm to gain her own power? “And what you said earlier, about feeling like you were in the wrong life? I’ve felt that too. Felt it right up until the moment I decided to stop trying to run from storms and hunt them instead. I know what it looks like when someone finds the life they were meant to have.” This world immediately had me tangled into it’s effortless dialogue, beautiful world-building and strained relationships. The storms themselves are mesmerizing in their description, being nearly sentient in their ability to seek out and destroy. Having lived to long in an area that has unpredictable, and at times extreme, weather… I could feel and appreciate the temperament of the different storms meandering through the pages. And all the while, I still felt a greater connection of the tempests with the plot itself. Each incident leads you to dwell on the delicious suspicions that surround their magic and Aurora’s magic-less body. The aptly named Rage season exposes the readers to a gambit of emotions, from anger to despair, playfulness to wanting–it is a non-stop thrilling ride through the cities and wildlands of Caelira as Aurora seeks answers and confidence. “Sometimes she was Aurora. Confident. Clever. Cultured. Sometimes she was Rora. Afraid. Alone. Ashamed. And more and more, she was Roar–bold, brash, and increasingly baffled by the situation in which she found herself.” I particularly enjoyed the multiple POV in this book as more and more interesting characters were introduced, including a stunning villain who wields terrible power and yet we have to wonder what their true motivation is… is their ill-will justified in some odd way? And can anyone stop the oncoming destruction? I feel like everyone has a back story in this world, and it is welcome. The more Roar, the better. I cannot wait to see how the rest of Carmack’s series unfolds! This first book in the left me wanting more and more. Her practiced hand at building romantic tension shined in the later chapters, reminiscent of some other recent popular YA/NA crossovers (but without heading into NA territory). Highly recommended read for those who love fantasy, adventure and romance. Eagerly waiting for the next chapter. A unique and magical romance fantasy! Loved it! The world that Cora has created in “Roar” is so captivating and unique; it’s a refreshing take on the YA fantasy genre that you won’t find anywhere else and will not want to leave once you enter it. I, myself, intentionally read this book slowly because I wanted to absorb every beautiful detail and every thrilling scene and make it last, but there was always this nagging feeling in the back of my mind, an impatient voice that compelled me to devour every word on the page. I was so immersed into this story that I never wanted to leave. You may think some storms are scary in real life, but in the world of the Stormlings and Stormhunters, they are all downright terrifying (yes, even fog)! The Storms themselves feel like their own characters, not just because they literally have their own hearts (Stormhearts), but also due to their semi-sentient nature which makes them even more dangerous and frightening. But, despite these fearsome foes, Caelira feels like such a magical and exciting world to be in, especially if you’re a powerful Stormling or a brave Stormhunter. Our heroine, Aurora, is one of the most strong-willed, honorable, stubborn, and bravest characters in the entire book and I absolutely adore her. She has spent most of her life pretending to be someone she is not and trying to become the person others want and need her to be, suppressing her desire for adventure and freedom. Arranged to be married to a mysterious Stormling prince to keep her secret hidden and to protect her people, Rora almost fools herself into thinking that she can be happy in such a gilded cage; sacrificing her true self for the good of others. Until she begins to uncover secrets her betrothed, Prince Cassius Locke, never meant for her to discover. It quickly becomes clear to Rora that if she wants to find happiness and protect those dear to her, she must take destiny into her own hands to become the queen she was always meant to be. I loved seeing Rora slowly transform into her Stormhunter alias, Roar. Despite her sheltered and privileged upbringing, Roar is a natural-born fighter and does not give up easily. No matter how difficult things become or whatever challenges arise, Roar stubbornly refuses to back down – sometimes frustratingly so. Locke, their leader on the battlefield, often finds himself at odds with Roar and somehow always manages to say the wrong thing, which then leads to their frequent conflicts. I believe part of it has to do with his natural tendency to push everyone to do and be their best, which causes him to appear bossy but he pushes himself the most out of everyone else. He is strong in every sense of the word and had to grow up quickly when he was younger. I. LOVE. HIM. He is very protective and loyal to those he cares about, and often times seems as if he’s carrying the weight of the world on his shoulders, similar to Roar. Their undeniable chemistry and romance is one of my favorite things in this book. I loved seeing Roar and Locke challenge each other to be the best versions of themselves, and slowly change to fit together perfectly. Even when they were competing or flirting, it always felt as if they were on equal ground and always giving as much as they were taking. If I could choose a group of best friends I would want this group of Stormhunters to be them. They have such an amazing group dynamic and I really love how close they all are to each other. It’s clear that they don’t just see each other as ‘co-workers’ of sorts, simply working together for one common goal, but as family. They tease one another and argue like families do, understand each other’s strengths and weaknesses, and always have each other’s backs. They are so diverse; no two people are alike and they each bring various skill-sets and personalities to the table but that only strengthens them as a whole. Cora’s writing is so rich and engaging, you can’t help but become enthralled with this new world she has created. She allows the story to unfold naturally without throwing out too much information at once, enabling readers to digest and experience everything as it is revealed, then drops plot twists and surprises along the way to keep you on your toes. 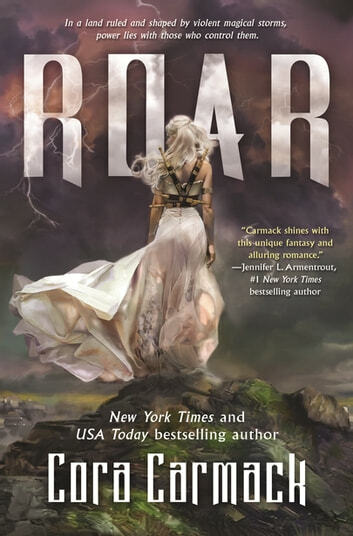 Full of twists and turns, swoon-worthy romance, secrets and devious plots, and dynamic characters, “Roar” is certain to become your next favorite YA fantasy read! Seriously, gripping, deep, romantic and just a wonderful read. Love it!!!!!! There are so many wonderful things I can say about this book, and it’s not because I adore Cora Carmack and I support and love everything she writes but because this book is so freaking good! I’m not one to start a new fantasy book, I usually just read the ones that belong to a series that I’ve already invested time in the past, I love fantasy but it always feels so daunting you know? Like getting to know new characters, new settings and it always seems like there a lot to learn but with Roar I had no hesitations. One of the things I love about Roar is that you learn about this new world throughout the book which for me is the best way, there nothing more unappealing to me than reading 1 or more chapters with just the “you need to know all of this before you start reading” story. In Roar we learn about this new world through Roar’s life, we learn some things about the past and some about the present, leaving us always with a need to know more and more. Now, here Cora introduces a really cool concept, one that I think is super original and one that got me thinking maybe I could be a Stormling too! So, we have people who can control/fight storms, all kinds of storms and to fight each one you need a special set of skills and equipment so we get introduced to a bunch of people that make it their life to fight these storms and contain their power. The book if full of adventures and mysteries, there is so much I want to say but won’t because I think you should enter into this world with no spoilers so you can let yourself go by the amazing writing. If you like a bit of romance with your fantasy, don’t worry in Roar we have plenty of that, some of the scene will give you butterflies in your stomach! Swoon swoon swoon! 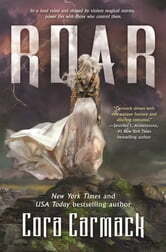 So, to sum up, READ ROAR! You will not regret it, is an amazing first book in a series, one that is guaranteed to bring you back for the rest of the books, you also have, adventures, mystery, romance and cool magic!